Ever since I’ve become President, people often approach me and ask, How are you doing? My answer is generally a simple but honest, I’m learning. Then comes the inevitable moment of confusion, as they were expecting the usual upbeat perspective of a CEO. They say something like, Oh, it’s that bad? The exchange forces me to clarify how excited I am to be a leader right now because I love to learn. There is nothing I’d rather be doing than learning. It often isn’t easy and I’ve made mistakes. Knowing our limitations is what makes us human; ignoring them is what helps us believe we can lead. Having a sufficiently big ego means you’re comfortable enough not to have one at all. 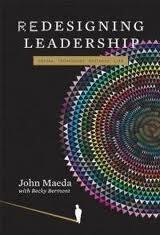 Leadership for Maeda is about vision, communication, and community building, and this book is primarily an exploration of the challenges of communication and convening in learning communities. Although he had initially set off in one direction, using electronic media to communicate to his constituencies as college president, but now, in this book, he offers pained and poignant cautions and caveats. A leader’s job is to get people on board with his vision. Computers make it so simple to communicate. Social media like blogs and Twitter have made it even easier to broadcast to thousands. Ironically though, with all the communication technologies at our disposal today, it’s still difficult to get a message across to the person sitting right next to you in a reliable fashion. More exposure to information doesn’t equate to true understanding. I’ve come to realize, however, that while technology may make it more convenient to communicate, it doesn’t improve our ability to get a point across. Nowadays, I try to minimize blogging and email, which I had so favored when I arrived here at RISD. Maeda explores the value of transparency, a central element of our age, and finds it wanting. It may offer some value to make one’s thinking and decisions more public and more visible, but it doesn’t mean constituencies will understand or agree any better just because it is out there. Educational leadership communication, like Presidential politics in Iowa and New Hampshire, he has learned, will always be more a retail than a wholesale vehicle. His advice? Be human, be concrete, be present, be receptive, be vulnerable. A simple trick to achieve clarity: use “for example.” Facts are usually much more useful when presented with examples that enable an audience to connect with information at a deeper level. A “for example” is often what we need to make the light bulb of clarity go on not just for the audience but for you as the leader. what I’ve become more and more enamored of it the simplicity of a conversation between two people. It is high bandwidth, engaging, interactive, and, putting on my fiscal hat, expensive. Yet I’ve discovered it is the greatest tool that a leader really has and is her best chance to get a point across. The audience doesn’t necessarily listen to the graphics [no matter how terrific they are] but instead they respond directly to the pitch of my voice…. assume that the audience is non-English speaking, even in the US. What is important is the tone, hand gestures, and emphasis in the voice. So I’ve given up on Facebook as the best means to pull people together and have turned to a more traditional technology: free food. Since my years as a professor, I have seen the two words “free pizza” scribbled onto a sign or in the subject line of an email as a powerful motivator to convene large numbers of students who might not be inspired by other possible two word combinations. Food and fire have brought people together since the beginning of time. I’m not so good at making a fire, but luckily I can cook, and I’ve used that skill on a variety of occasions. Making people work together can be fairly challenging, but getting them to eat together is somehow vastly easier. A meal is often a catalyst for a conversation that can lead to collaboration, and a meal is a natural happening to signify closure when collaboration is completed. And yes, I’ve gained weight since beginning as president so I can literally feel the collaboration happening. As a blogger myself, and a fond user of Twitter for learning, sharing, collaborating and networking, I am clearly a fan of social media in educational leadership. 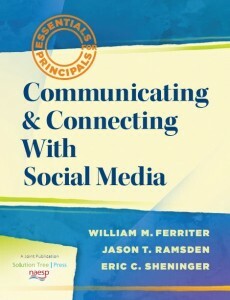 Indeed, I recently offered a back cover blurb for a recent book written by several friends, Communicating and Connecting with Social Media: A Guide for Principals (if you are interested in my blurb, click on the book’s Look Inside, then “Back Cover”). But as much as I continue to believe they have their purposes and value, electronic communications will never be more important than personal and face to face ones. Greeting students and parents at the drop-off curb, spending time lingering before, during, and after parent association meetings and athletic events, and yes, eating pizza and other good foods together are at the core of educational leadership, forging community and strengthening communications one constituent at a time. I can’t say upon reading this that I believe President Maeda has “redesigned leadership.” It is almost the opposite: he has rediscovered primal and emotional leadership: he is reaching backwards and inwards, not forward to the future or upwards to the virtual world. But this little book is a valuable, human, humane meditation on the most important element of leadership: communicating and connecting one person at a time. We often forget the WHY and the HOW which are far more important than the WHAT we do. “People don’t care how much I know until they know how much I care.”. The tweets still have their place, just not taking the place of the former.